Just steps from a pristine beach, we’ll ignite our passion for life through Hatha Yoga, Kundalini Yoga and a variety of meditation practices. These ancient practices will open you to all the possibilities you can create in your life so you can live a life of balance, optimum health and joy. Daily yoga classes will be lead by Devinder Kaur and Laurie Howe. Rejuvenate in the ocean, lounge by the pool at our luxurious private retreat casa, and explore a quaint town on the Mayan Riviera. Open Time: Choose one of the optional excursions, lounge by the pool, spend time at the beach or stroll into town. Relax, laugh and recharge…take this time for you to awaken to your pure potential and embrace all of the possibilities in your life! No experience necessary in yoga or meditation. All levels welcome and all activities are optional…do as much or as little as you like! Our retreat location is the beautiful, luxurious and private retreat house called “Casa Om”. 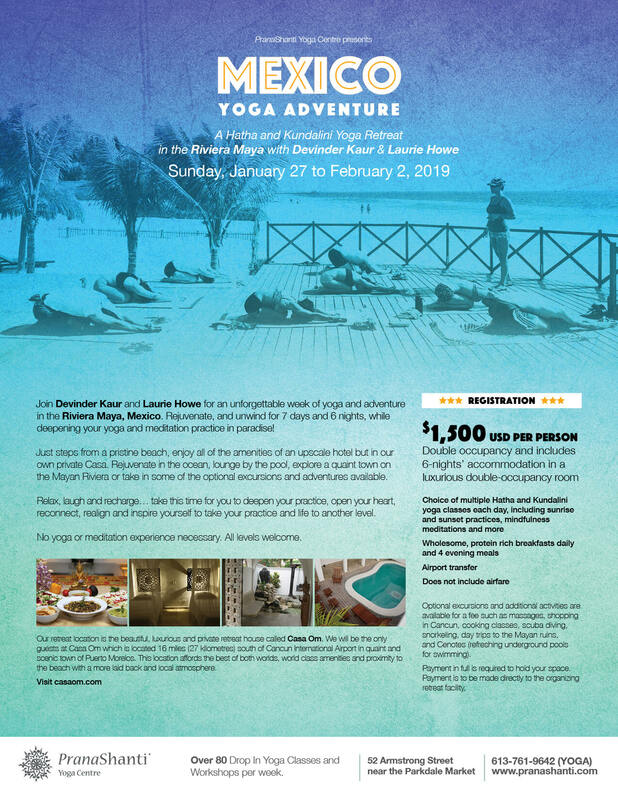 We will be the only guests at Casa Om which is located 16 miles (27 kilometers) south of Cancun International Airport in quaint and scenic town of Puerto Morelos. This location affords the best of both worlds, world class amenities and proximity to the beach with a more laid back atmosphere. Optional excursions and additional activities are available for a fee such as spa treatments and massages, scuba diving, snorkeling at reef, day trip to the Coba or Tulum Mayan Ruins, and local Cenotes (refreshing underground pools for swimming). Prices vary depending on the duration and type of the trip and start at $35.00 USD per person. Direct flights are available from Ottawa to Cancun with WestJet. Prices range from $500 to $800 per person. Once you notify Casa Om of your flight timings, they will arrange your airport transfers. Refunds, minus a $500.00 + HST Administration Fee, are available up until 30 days before trip departure date. No refunds or credits will be provided after that time. You may arrange for another person may take your place. All travel arrangements, changes and cancellations are the responsibility of the retreat participant. We recommend purchasing travel cancellation insurance once you have made your reservation. PranaShanti is not responsible for your expenses incurred in preparation for any cancelled retreat, such as airline tickets, loss of work, and/or other costs associated with preparing for your trip.